RUSH: Jeff Bezos. Yeah, he’s Amazon. But Jeff Bezos owns the Washington Post. 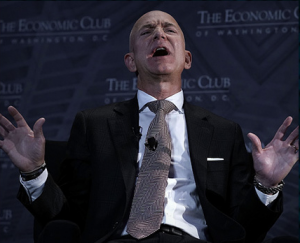 Jeff Bezos sent out photos of his genitalia to his mistress, and Donald Trump is being blamed for it. Because the people that have the photos happen to be the National Enquirer. In a bit of irony, the guy that runs The Enquirer is named Pecker. So a guy named Pecker has some pecker shots of Jeff Bezos, and Jeff Bezos claims that he’s being blackmailed and extorted.